When Airtel is going to start 3G in delhi NCR region? yes, I too faced the same issue. I called the cc to make a complaint and they told me that they are adding more towers. lol I asked then WTF I am paying for 3g when I lost signals. 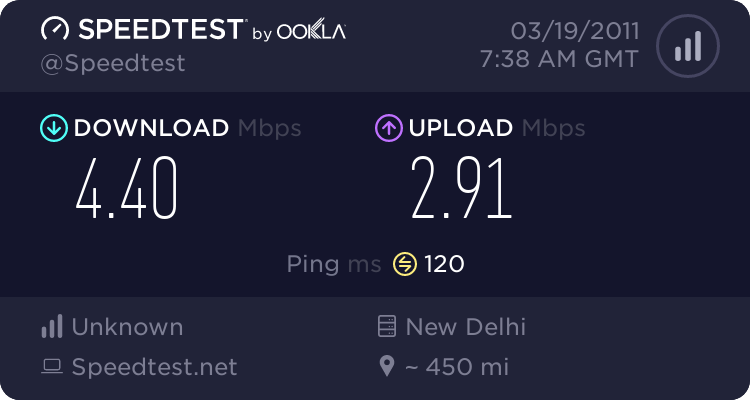 I am back to 2g, lucky hadn't recharged the 750rs plan, just did with 200rs to get 200mb which I downloaded the same day while walking in a park. its common problem with GSM-3G service as they function on 2100 band. if you keep the device near a open window, you would find marked improvement. What about using both modes together? I didn't get that, you mean recharge with 2g plan and use it with 3g ? Aint they gonna cut off my balance ? I don't wanna lose my 2k+ balance for such trick ? Best do all this short cuts with a pre paid sim and not your main no! Yes ! Better to get a new pre paid sim and do experiments like this. Airtel is giving promotional offer to all its customers till further notice. I also use 98 recharge for 2gb on 2G and i got a sms from Airtel as a promotional offer you can use 3G at 2G speed rates so i changed my network mode to dual and now i am getting 3G speeds at 2G rates. But it will not last for long, at last you will need to shift to 3G or stay back to 2G in any case the prevailing charges will apply as per usage. Let it go like that till they re think. Vodaphone which is under trial in Tamilnadu-has announced that till April 1st or so one can enjoy 3g speeds in GPRS plans. Thanks for the commercial. Let us discuss the issue now.